Starting another wonderful week with some fun posts. I have a list of posts...I can't believe I have so many things to show you. But First! My Begonias didn't grow in my Guest Bathroom. I was so disappointed. New valance, new plant, candles and my handmade soap in some apothecary jars. The new valance is made from a twin size bed dust ruffle I found at TM for a nifty price. My favorite store. I used the same 2 1/2" hardware that had been used to hang the peach valance for 21 years. I think it was time for a change. It was so easy to sew with all the hemming done. I just turned the top over and made the header. ready made valances and custom made valances and fabric to make the valance. I made this one in less than a day. With ripping, sewing, and hanging. Very Thrifty!! Yes? I have added a new look with my new Orchid (Phalaenopsis) plant. When my last endeavor to grow Begonias in the bathroom failed. I thought a softer, more neutral colored plant would look attractive. And with my neutral colored valance the orchid is perfect. I chose a moth orchid because its colorful, long-lasting, and simple to grow. The reflection in the mirror looks like I have two orchids. A few changes on the etagere . Some sea shells, candle, handmade soap, and handmade bath salts too. Handmade soap with a french Fleur-de-lis. Vintage looking towels to finish off the softer look. I love the new look of my Guest Bathroom. Thanks for stopping by! I hope you have enjoyed your visit to My Cozy Corner. Please visit these wonderful bloggers and their beautiful blogs. Lovely bathroom makeover and mosaic! I hope you have a happy week ahead. Your guest bathroom looks lovely! Very pretty touches. Very restful...it's great to be thrifty when it looks that good! It looks lovely with fresh new touches! Have a good week! How lovely! I love the orchid and the way you have the soaps displayed. Your guests will never want to leave! heehee! You made this powder room so lovely...I like the fleur de lis soaps and all of the other accents. Great makeover - so bright and pretty. I love the soaps in the apothecary jar, and the orchids. 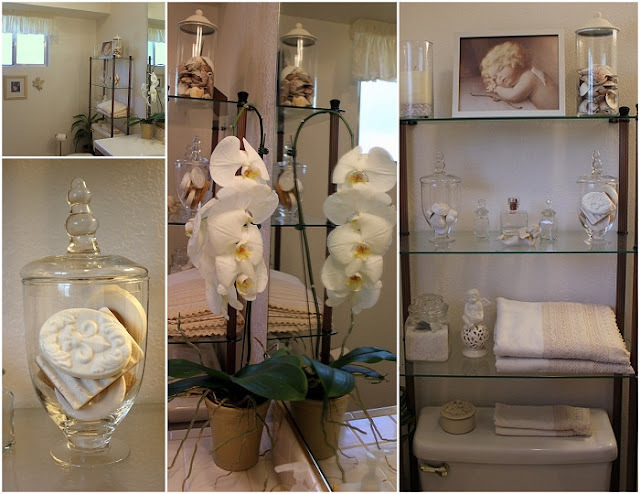 Your guest bathroom looks so pretty! Can I book a room?? I love the idea with the dust ruffle. How CLEVER!!! I LOVE Orchids and the bathroom is a perfect spot for one. I like it better than the begonia in there...AND...can't beat the effect of the mirror DOUBLING it for you! "PERFECT"! What a beautiful bathroom, and what a clever idea to use a dust ruffle as a valence--I will have to remember that! Your handmade soaps look like confections--gorgeous. What a wonderful guest bathroom! LOVE it!